The Cloud represents a market where Oracle wants to win. The 24 services launched by the database leader include all the tools companies need to conduct their operations in the cloud and thus should help customers make the move to the cloud. Oracle Cloud Platform was enriched by nearly 24 new services for developers, IT professionals, end users and analysts to achieve, to expand and more easily integrate cloud applications. They are Oracle Database Cloud – Exadata Service, Oracle Archive Storage Cloud Service, Oracle Big Data Cloud Service and Big Data SQL Cloud Service, Oracle Integration Cloud Service, Oracle Mobile Cloud Service and Oracle Process Cloud Service. With the new services launched, companies can move all their applications hosted in the data center to the cloud Oracle. Oracle now claims to be the only cloud provider to offer a full range of enterprise software services, platform services and infrastructure services under the banner Oracle Cloud Platform. Compared to Oracle, cloud providers have chosen to focus on certain services: Salesforce.com has specialized in software and services Amazon has essentially focused its activity on infrastructure services. The provider has also launched several integrated cloud services that must allow companies to move their operations to the cloud, including a service to develop and execute mobile applications directly from the Oracle cloud and an integration service which allows them to combine multiple enterprise applications into complete systems. Oracle now offers online services for enterprise resource planning, managing the customer experience, management of human resources, management of business performance, and management services supply chain. 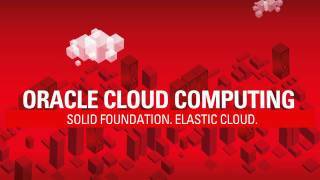 The aim of these new offerings is to make Oracle a single window for all the cloud computing needs. Oracle Databases deployed in the cloud as part of this service is 100% compatible with those deployed on-premises, thereby enabling a smooth migration to the cloud and seamless transition to a hybrid cloud strategy. The Oracle Big Data Service Cloud and Big Data SQL Cloud Service is a secure and efficient platform to run various loads on Hadoop and NoSQL databases and to help companies collect and organize their big data. Oracle Mobile Cloud Service offers a set of Android applications development tools or iOS operating entirely in the cloud. The developer can use Mobile Cloud to build a user interface or to configure an API for data exchange. All development will be done entirely through a browser, so it is not necessary to install software on the desktop machine to each developer. Developers can use their favorite languages ​​or go through the Mobile Application Framework Oracle framework. The service also includes a software development kit (SDK) that allows developers to follow their application, for example to know who uses it and how it is used. The company also launched a service called Oracle Integration Cloud Service, which allows companies to work together their different enterprise applications and cloud services. Finally, Oracle has updated Business Intelligence Cloud Service, in particular by equipping it with new data visualization tools. Oracle wants to clearly position themselves to Amazon, its main competitor, which also offers various solutions in the cloud. To attract customers, the company also said that the group is ready to compete with Amazon on price. Oracle claims 70 million users in the cloud. The services offered by Oracle are from 19 data centers spread across the planet, which manage 700 PB of data.